Epson XP-257 is just the perfect blend of style, affordability, flexibility and versatility. The device is a wireless small-in-one that beautifully fits into a home office or home environment without much effort. The small-in-one inkjet device can easily squeeze into a small space with a weight of 3.9kg and dimensions 390‎ x 300 x 145 mm. Both printer and scanner outputs are impressive with a resolution of 5,760 x 1,440 DPI and 1,200 DPI x 2,400 DPI (Horizontal x Vertical) respectively. In addition, the print speed for white and black mode goes up to 27 ppm while for the colour it goes up to 15 ppm. Epson XP-257 ink cartridges are available for individual installations which makes printing more affordable. The photo printing experience gets better with features like WiFi and WiFi direct that enables users to directly print from mobile devices using a wide range of compatible apps. The small-in-one can easily be connected to Windows and Mac Computers for direct PC printing. Epson XP-257 is a versatile yet simple solution to printing, copying and scanning easily from anywhere around the home. The small-in-one is packed with a variety of features that make it a much sought after candidate amongst home users. You have the option to print and scan high-quality outputs using wireless connectivity. Also, you can print directly from a smartphone using a range of mobile apps. So, you have this printer designed to create any school project at home or just quickly wind up with domestic bills. How to check the ink level of Epson XP-257 ink cartridges? From the start menu open control panel. Click devices and printers. Select Epson XP-257 printer and access the printer driver window. In the main tab, click Ink Level. Make sure that the EPSON Status Monitor 3 is enabled, else the ink level will not be displayed. To enable Epson Status Monitor 3, click the extended settings in the maintenance Tab. Select enable Epson Status Monitor 3. From the Apple menu, select system preferences. Click Printer and scanner. Then select the printer. 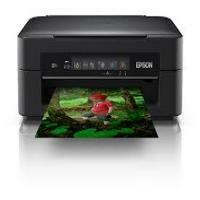 Now Open Printer Utility window and click EPSON Status Monitor. You will be able to view the ink level of all the Epson XP-257 ink cartridges. How to check and clean the printhead nozzle? Using the power button, turn off the printer. Now, turn on the printer, make sure to hold “stop current operation” button in the downward direction. Further, when the power light flashes, release the button. Wait for sometime while the nozzle check pattern is printed. If the printhead nozzle is clogged then you will observe, broken lines or missing segments. If no broken lines or missing segments are observed then there is no need for printhead cleaning. From the start menu, access the printer driver window. Click Nozzle Check in the Maintenance tab and follow the on-screen instructions. Load A4 size paper in the printer. Open printer utility window from the start menu. Click nozzle check and follow the on-screen instructions. Printhead cleaning is performed when the print quality is degraded. Even if you face the print quality issue then change or reinstall the Epson XP-257 ink cartridges. Q. What is the difference between buying Epson XP-257 ink cartridges in multipacks and buying them individually? A. There is no difference in the cartridges provided in multipacks or in individual packs. However, buying a multipack is cheaper than buying all the colours individually. Multipacks are recommended for heavy users who may require a replacement for their cartridges regularly. If you are an occasional user, it is advised that you buy the ink cartridges individually as the ink cartridges may dry up before you use them. Q. What are the different devices that I can use with my Epson XP-257 printer to print pages? A. You can connect the printer with your Windows and Mac operated computers. You can also print pages using mobile devices through the built-in Wi-Fi feature of this printer. Q. Are there more ink cartridge colours that are sold for Epson XP-257 printers? A. You will not find colours other than the ones mentioned on our website. Epson XP-257 ink cartridges are only available in magenta, cyan, yellow and black. This is because Epson XP-257 printers use the CMYK (cyan, magenta, yellow, black) colour model for printing. These four colours are primary colours that make all other colours when mixed in certain ways, hence more colours are not available for this printer. Q. Does this printer come with a duplexer? A. Yes, Epson XP-257 is capable of 2 sided printing. They come with a manual duplexer which enables you to print on both sides of the paper. However, it is not an automatic duplexer and you will have to flip the pages to print on the opposite side. Q. As an art student, I require good quality printouts. Will I get the same print quality as the originals when using your compatible Epson XP-257 ink cartridges? A. Absolutely! If you want to cut down on your costs without compromising on quality, you should definitely opt for our compatible ink cartridges. All our compatible ink cartridges are FSC tested and certified and are capable of producing the same print quality as the original ink cartridges.